Just a little ways past 61st Avenue North in the Cherry Grove section of North Myrtle Beach, South Carolina is Sea Pointe, an oceanfront North Myrtle Beach resort that can be the home for your next North Myrtle Beach vacation. This North Myrtle Beach resort is a high-rise where every North Myrtle Beach vacation rental has a glorious view of the Atlantic Ocean. Sea Pointe is right on the oceanfront so you are only a quick elevator ride and a few steps away from letting your bare feet sink into the warm white sand. Sea Pointe has a multi-level parking garage for your convenience that is connected to the oceanfront resort. It also features a grill area with tables so you can have a beachside barbecue during your North Myrtle Beach vacation. 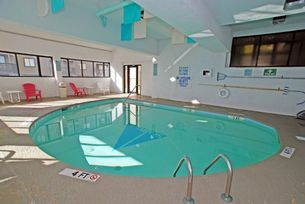 And this North Myrtle Beach resort has an indoor swimming pool that everyone will love! So make plans to stay at Sea Pointe for your next North Myrtle Beach vacation. There are dozens of North Myrtle Beach condominiums from which you can choose. If you are looking for a smaller North Myrtle Beach rental that is ideal for a family of four, then you might be interested in the one-bedroom, one-bath North Myrtle Beach condominium. For a little more privacy, a family of four might prefer the two-bedroom, two-bath North Myrtle Beach rental at Sea Pointe. If your family is larger or if you are bringing some friends with you on this North Myrtle Beach vacation, then look at a three-bedroom North Myrtle Beach condominium at this North Myrtle Beach resort. The three-bedroom condo in North Myrtle Beach, South Carolina has two full baths. These spacious North Myrtle Beach condominium rentals can sleep six, eight or nine people quite comfortable. Most of the three-bedroom North Myrtle Beach rentals accommodate a couple people on a sleeper sofa in the living room. There are penthouses on the top floors of this North Myrtle Beach resort and they are quite large. The North Myrtle Beach penthouses at Sea Pointe have five bedrooms and can sleep one dozen people. The penthouses are a great North Myrtle Beach vacation destination for a golf foursome. While the number of bedrooms and the number of people each of these condos in North Myrtle Beach, South Carolina can accommodate are different, there are some things that are the same about all of the Sea Pointe North Myrtle Beach rentals. All of the North Myrtle Beach vacation rentals come with a fully furnished kitchen. And each of these kitchens has a dishwasher. Plus, all of the North Myrtle Beach condo rentals at Sea Pointe have a washing machine and clothes dryer for your utmost convenience. These appliances can really come in handy during your North Myrtle Beach vacation. Your family and friends can have clean clothes and clean dishes with little effort and without taking up much time that you could otherwise be spending on the beach. Elliott Beach Rentals is not affiliated with onsite management or the HOA of Sea Pointe.